Combine layers of frozen ravioli for our Baked Ravioli for Weeknights. 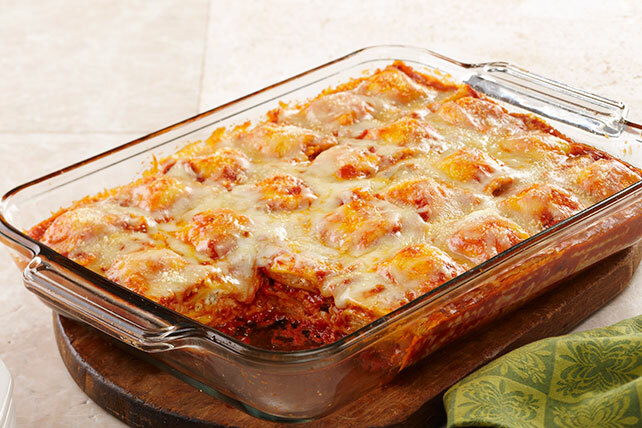 This tasty baked ravioli dish is easy to assemble on even the busiest of weeknights! * Made with quality cheeses crafted in the USA. Combine pasta sauce, tomatoes and water. Spoon 1 cup pasta sauce mixture into 13x9-inch baking dish sprayed with cooking spray. Layer half each of the ravioli and shredded cheese over pasta sauce mixture in baking dish. Top with remaining ravioli and reserved pasta sauce mixture. Sprinkle with remaining shredded cheese; cover. Bake 45 min. or until heated through, uncovering after 30 min. Sprinkle with Parmesan. Round out this easy-to-make pasta dish with a crisp mixed green salad tossed with your favorite KRAFT Lite Dressing. For best results, use large round or square ravioli (about 12 per pound) to prepare this delicious pasta dish. Add a layer of 1 pkg. (10 oz.) frozen chopped spinach, thawed and well drained, between the ravioli layers.